Types of carpet beetles include the black carpet beetle, which is dark brown to black, and the varied carpet beetle, which is black with yellow and white scales on the wing covers. The underside of the body is grayish-yellow. Signs of infestation can be found on clothing with furs having tips of the hair being damaged, and larval skins present along with minute droppings. 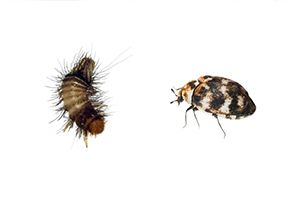 The carpet beetle feeds upon a wide variety of plant and animal products, which include bones, carpets, wool, fur and other dead insects. They can be found in ceiling voids, abandoned nests in the attic, behind and under baseboards and in dead animals. Sanitation practices need to be maintained to reduce infestation. Control of the carpet beetle can be achieved by cleaning, eliminating the infested clothing, or pesticide treatment. The firebrat, also known as the bristletail, has a teardrop shaped body and gets the common name of bristletail because of the three long bristle like appendages at the end of its body. The firebrat is wingless with a flattened body and is generally covered with scales. They are grayish in color, some having numerous dark markings. The antennae are long and threadlike. Favorable conditions for the firebrat are 90 to 106 degrees Fahrenheit; places with high humidity and temperature are a potential harborage and include locations like boiler rooms, attics, around ovens, furnaces, fireplaces and hot water heaters. The firebrat/bristletail lifespan is about 1 to 2 ½ years. Infested material has yellow stains, scales, feces and feeding marks such as holes and notches. They are fast runners, prefer the darkness, hide during the day and can be found to hide in cracks. They feed on carbohydrates and proteins such as oats, dried beef, silk, linen, cotton and rayon carpets. The species most encountered in clothes is the webbing clothes moth. Another species is called the casemaking clothes moth. The wings of both species are long and narrow and the body is golden in color except for reddish tint on the webbing clothes moth. Signs of infestation include silken tubes that are hidden in the clothes. The hair on fur clothing will be clipped at the base, which causes loose hair and visible portions of the hide to be exposed. If the moths cannot be found, air ducts are a possible location and should be properly cleaned and maintained regularly. 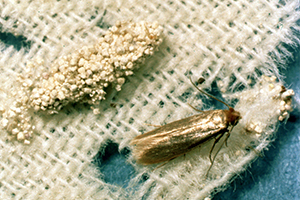 The casemaking moth will primarily attack materials of animal origin but also include plant material whereas the webbing clothes moth attacks materials of animal origin and sometimes synthetic and natural blends. Control of moths includes good sanitation, proper identification and possible pesticide application. Silverfish look like the firebrat having a carrot-shaped body and three long bristle appendages at the end of their body. 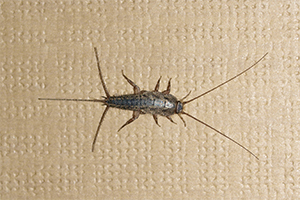 The silverfish is wingless with a flattened body and is generally covered with scales. They are silvery to gunmetal in color. The female will lay her eggs in cracks, under objects or even out in the open. A temperature of 72 – 90 degrees Fahrenheit along with 50 to 75% humidity is necessary for the egg to hatch. Silverfish will hide during the day unless they are disturbed. The silverfish feed on proteins and carbohydrates and are cannibalistic. 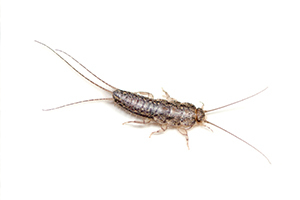 The silverfish is not limited to temperature or humidity and can be found anywhere in a building. They are feeders of paper products, cotton, silk, rayon, linen and prefer starchy products.